I can't believe the weekend is over already! I saw my cousin on Saturday and then went for some lunch with my Mum on Sunday. I went into Boots thinking I would buy some nail polish and actually ended up not buying any! I bought foundation, eyeliner, eyeshadow and yet another lip pen, but no polish! I felt very proud of myself, because I am supposed to be on a no-buy!!! Anyway, today I have a Barry M Chameleon polish to show you. These came out a month or so ago and I bought two out of the three shades. The Chameleon collection is unique(ish) in that you paint the polish onto your nails and it is one colour, and then when you apply topcoat, the polish changes colour. I believe Nº7 had something like this a few years back, but at the moment this is the only polish of this kind that is readily available in the UK. 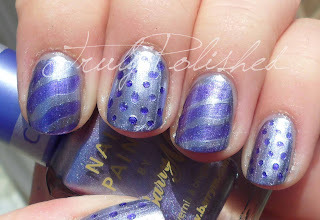 Lilac is light purple foil that changes to a dark purple metallic colour after you put on topcoat. It's really strange because the dark purple has a totally different finish. It's hard to explain, but it looks like you have a blob of dark purple jelly on your nail! Okay, enough of the strange explanation and onto the photos! Both were taken in sunlight and show two coats of Lilac. This is pretty much a one coater, but I put an extra on just in case! And here it is with clear over the top. I used a dotting tool for the dots and then just the brush from the clear polish for the waves. I believe the clear I used was by NYC Colors. I really like this idea. It's a good way to put your own stamp on a manicure without having to go to too much effort. Originally I wasn't going to buy this colour, but I saw it on a blog and fell in love with it, I think I like it more than the other one I have, which I'll be showing you soon! This polish retails for £3.99 and is very widely available. You can buy it online at ASOS, Barry M, Boots and Superdrug, or in store at selected Boots and Superdug. See you tomorrow! I'm working on a post that's a little bit different. I told you I was working on including some different features and things, so I'm doing it little by little. You never know, though, I might just chicken out! You'll have to just come back and check it out!